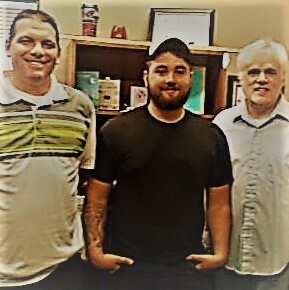 Zackary (center) celebrating his achievement with Goodwill staff, Andy Brehm (left) and Allegany College of Maryland Instructor, Glenn Burns (right). What is “achievement”? I’m glad you asked! Achievement is defined as “a thing done successfully, typically by effort, courage or skill”. I love, love, love this definition! Last summer, ACM started offering GED and Adult Basic Education classes at our Goodwill Career Readiness Campus in Cumberland, MD. The ACM Team wanted their classes to reach more people and we wanted we wanted more of our clients to continue their education. Since September 2016, thirteen (13) people have enrolled in classes, and almost half of those students also enrolled with Goodwill in our paid work training program. Now, individuals who want to get their GED/diploma and need to find a job or earn a paycheck, can come to one place and do both – go to class in the morning, then walk across the campus and go to work after lunch. Congratulations again Zackary! Goodwill is honored to be a part of your journey. For more information, feel free to contact me at cfleming@goodwill-hgi.org. And, as always, please check us out on Facebook and Twitter.